The A269 Bexhill Road has been blocked both ways following a collision between a car and a telegraph pole. The collision happened between Peartree/Potman’s Lane and Lower Street, in Ninfield. Police said a vehicle struck a telegraph pole and caused a power outage in the surrounding area. 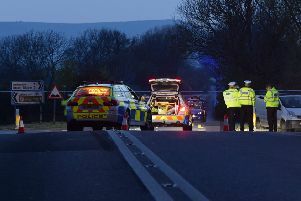 A police spokesman said: “At 5.43am on Monday police received a report that a car had collided with an electricity pole on the A269 Ninfield Road between Ninfield and Bexhill, causing the pole to lean at a dangerous angle. “Live wires had to be turned off and road closures were set up at the road’s junction with Pear Tree Lane and Lower Street, Ninfield, while the incident was dealt with. UK Power Networks said the TN33 9 and TN39 5 postcodes were disrupted but power has now been restored. The road was blocked and slow traffic was reported.